1)When Receive Bluetooth headset, please charge firstly. When the Blue light is on (light), power is full. 2)When Bluetooth headset is power off, keep (long) press MFB button till (pay by blue light flash three times) till the blue light and red light is flashing (flickering) alternatively, and then open your Bluetooth switch of cell phone to search the Bluetooth headset. 3)If failure, please turn off Bluetooth switch, then turn on to search again. Do more times. This Bluetooth headset is painless wearing and Safety. Non Ear plug and the built-in speaker are closer to the ear and not inside the ear. The sound waves reach ear in nature way, just like you hear sound from outside. No pain or sensation of swelling which comes from ear plug in long time use. The opening of ear hole let you hear outside noise and keep safety headphones for running, business, travel. 0.28OZ weight, very light, no pressure or pain feeling in long time use. 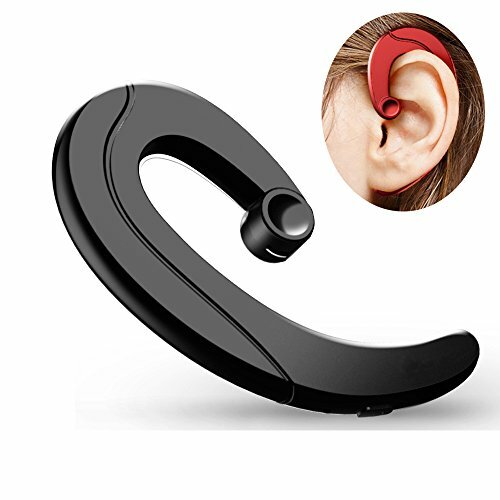 Ear hook designing and Ergonomic design, wireless headphone affixed to the ear, suit for all peoples, do not fall when running. Wear in left or right ears, with glasses is ok. With Built-in microphone is for Hands-free calling. Pure sound, no impurity. Using CVC6.0 + DSP audio processing dual noise reduction technology, optimize the human voice in high and middle frequency, isolate the interference, make it clear. High-performance lithium battery, 120hours standby time, 4-5 hours music play, 5-6 hours phone call,1-2 hours fast charge. BLUETOOTH 4.1 headset compatible with all the Bluetooth enabled devices. This Wireless Earphone can connect with two cell phones in 8 meters. Connected back automatically when restarting the already connected smart phones. Automatically switch off long time no-use. This wireless bluetooth earbuds is 40day money return and 1 year replaced policy. In 40Days, contact us, refund. In 1 year, earphone malfunction, send you a new one. If you have any questions about this product by MYLARK, contact us by completing and submitting the form below. If you are looking for a specif part number, please include it with your message.